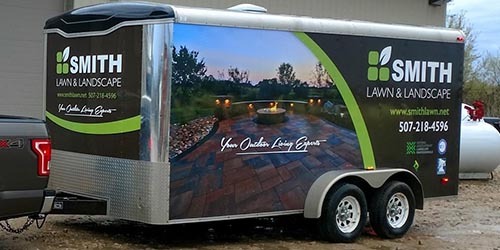 Here at Smith Lawn & Landscape service is our first priority as your lawn care and landscape company in the Minnesota area. Call us today at (507) 218-4596 to discuss your needs and schedule a free quote. You will always be greeted by a friendly lawn and landscape professional! Click here to conveniently request a quote online. Smith Lawn & Landscape has been providing exceptional landscape design, construction and maintenance since 2010. When you call us for information about our lawn or landscape services, you can count on the best in the industry customer service because we value you and your time. When you are ready for more information about how our services can help you complete your next project, give Smith Lawn & Landscape a call. We proudly serve Blue Earth, Nicollet, and Le Sueur counties. Take a look at our client reviews to see what your neighbors are saying about our work, and decide for yourself if we are the right lawn and landscape company for your needs. My one and only concern is that YOU are happy with the work we do for you! If for any reason you're not absolutely, positively 100% satisfied with our work, I WON'T BE HAPPY EITHER. That means I WILL NOT REST until we make it right. I will immediately send my team to fix the problem or address your concern, no questions asked... If it's still not to your satisfaction we will pay one of our competitors to fix it for you... That is how strongly I believe that you will love what we do. Let us prove it to you! Applying for financing through Greensky is quick and easy for Smith Lawn & Landscape customers. Click the button below and choose the option that is best for you. Once approved the credit can be used in conjunction with Smith Lawn & Landscape and our wide array of landscaping installation services.